Raymond Roussel’s 1910 work, Impressions of Africa, has popped up so frequently on the periphery of my awareness that before reading it this summer I had already formed a view of it as singular, dense, “crazy” (as one acquaintance described it) and above all, intimidating. Singular it may be, but in other respects the book I’d constructed in my head was not at all the one I found in my hands. Impressions of Africa is a surprising, strange hybrid, straddling novel, poem, and even travelogue, with obvious appeal to the Surrealists yet a concentration of crisp, concrete images that puts it close to modernist poetry. In fact, the book’s narrative shape - at least in its first half - might have been replaced with a poetic list of discrete concepts and images. There’s little in the way of plot and almost nothing in the way of interiority or psychology. Roussel provides a setting – the vast central square of the coastal village of Ejur in the mythological country of Ponukele in equatorial West Africa – but it serves essentially as a vast stage set for a seemingly unending series of rituals and performances, ranging from delightfully absurd to appallingly cruel, in connection with the coronation of the country’s new emperor, Talou VII. An unnamed European observer, one of many Europeans inexplicably observing and participating in these events, serves as narrator, and his recitation is as straightforward and detached as a spreadsheet, registering little in the way of emotion, reaction or opinion. Descriptions of these events go into exacting detail. This somehow manages not to be boring, in part because so many of the performances involve sequential steps and entertaining complications so much like Rube Goldberg contraptions that the end purpose, however pointless, has nothing over one’s fascination with the operation itself. If at times the narrator conveys these involved accounts as unaffectedly as an instruction manual for an appliance, they carry a similar fascination as with the awkward, blithely translated language of some such manuals: whatever practical information one might glean becomes secondary to the pleasure one obtains from the mesmerizing foreignness of the writing. I once heard Impressions of Africa described as “hallucinatory.” This does not seem quite right. Though some of Roussel’s performative rituals tend towards surrealistic, purely human productions - for instance, a contralto whose tongue, divided into different sections, allows him to sing all four parts of the “Frere Jacques” round by himself - others involve schematic, mathematical devices and designs of delirious complexity, marked by a combination of playfulness and an almost obsessive precision that calls to mind the determinate, biomorphic shapes of Wassily Kandinsky, the machine-like paintings of Roberto Matta or the playfully delicate, decisive lines of Paul Klee’s “The Twittering Machine.” Roussel’s imagination in creating some of these machines and demonstrations is prodigious; in one scene, he takes several pages to describe a complex loom operated by numerous paddles that dip into a river’s current and weave rich tableaux out of miraculously thin thread, resulting in a scrolling visual narrative of Ponukele history and culture. Another prefigures automatic painting by involving a multi-armed machine connected to a photosensitive plate that, in response to light (and turning photography on its head), causes the machine to execute a painting. Other acts appear primarily involved with demonstrating physical phenomena (amplification, multiplication, friction, gravity, volume displacement, for example) or biological processes (a good number of animals, and not the usual circus variety, feature in the stunts). Still others push beyond the bounds of credulity: a soft-boiled egg is peeled perfectly by a marksman’s shots; a cart containing a whalebone statue of a man with a spear thrust into his chest rolls on rails made of calves’ livers; a giant earthworm, its peristaltic undulations successively blocking and unblocking holes in the long glass vessel in which it lies in water, plays gypsy czárdás by producing drops that fall upon the strings of a zither; there is a spinning pinwheel of tentacles, the suction cups of which hold live, mewling, and apparently not very happy cats. I have only begun. A significant number of these performances involve music. In addition to the earthworm virtuoso and the aforementioned solo “Frere Jacques,” the coronation features numerous other musical instruments, song recitals, and curious tone-producing phenomena, including one in which a father’s voice bounces off the bare chests of his six sons who have positioned themselves in a meticulously determined geometric arrangement. However enthralling such conceits may be, three hundred pages of them might tax even the most patient reader; thus, nearly half way through the book, at the conclusion of a day and a half of coronation, Impressions of Africa suddenly switches gears. If the first half of the novel presents a baffling chaos of inscrutable ceremonies and mystery concerning the Europeans’ presence in Ejur or what’s behind their role in these curious rituals, the second half brings a controlled explanation. Roussel gives us an annotated list of characters followed by background information to illuminate all that one has witnessed. Some of this narrative helps fill in the plot – or rather, provides one - revealing that the Europeans, shipwrecked off of Ponukele, await the arrival of ransom from Europe to gain their freedom from Talou VII. The reason for their performances and a detailed explication of each one follows. But this exposition, like looking through the backside of a two-way mirror or having a magician reveal his or her tricks, serves as something akin to a caption for an image, providing meaning, altering our interpretation of what we have witnessed, but retaining an uncertain, unstable quality. For a moment we’re seduced into a rational explanation for the dazzling, magical and affronting events that have unfolded before us. But Roussel’s backstories, constructed of anecdotes, invented folklore, elaborate digressions and tales nested within other tales, form a narrative as complex, imaginative and mystifying as the intricate designs of the performances themselves, leaving us even more puzzled. The novel’s two-part structure comes across as something like one of those early Surrealist games such as “The Exquisite Corpse” or an Oulipian experiment in which the task is first to imagine a bizarre ritual in an exotic land then come up with a more bizarre story to explain it. Were it not for the entrancingly disorienting effect of incomprehension in reading the first part, one might even read these backstories first (one can imagine Impressions of Africa published tête-bêche, like one of those Ace Doubles mysteries that feature two novels bound together, each upside down from the other). It’s tempting to reduce Impressions of Africa to such a simple, game-like formula, but there’s a lot more going on in this curious narrative than the inventiveness of its conceits and its apparently infinitely cyclic, Mobius strip structure. Translator Mark Polizzotti notes in his introduction that even Roussel’s methods were of a cunning imaginative complexity, at times built around intricate puns and word play. Though this fascination with language is evident throughout Impressions of Africa (texts appear everywhere, starting with the pediment of the stage on which the words “The Incomparables Club” appear), Polizzotti has not attempted to reproduce Roussel’s more esoteric linguistic games, noting that few if any French readers even noticed his clever tricks until Roussel published a book on his own methods. But the real magic of Roussel’s work comes from the ways in which Impressions of Africa spins off suggestions and resonances well beyond its inventiveness. There’s something deeply unsettling in his catalog of rituals, unfolding in the square of a non-existent village in a non-existent country in an indeterminate time in an “Africa” of the imagination. Roussel seems to have taken conceptions of the exotic - both those of his own imagination and borrowings from popular misconceptions of Africa - and made of them their own country. “Africa” here is not so much a real continent as it is a repository for imagination and projection. It’s fascinating to read Roussel’s representations of the interactions of the Europeans and mythical Africans, the interplay of cultural assumptions, power, misapprehension, mimicry, wonder, and incomprehensibility (with some performances characterized as “completely inaccessible to European ears”). Impressions of Africa might make for an intriguing text for an anthropology or ethnology professor to use as a way of initiating discussion about interpretation, exoticism, and the function of the observer. Roussel also touches on politics as theater (and vice versa), the performative aspects of the affairs of state, and art as a transformative force: while the performances are instigated by the Europeans largely to alleviate boredom, they also serve to enchant emperor Talou VII and elicit from him, Scheherazade-style, a more generous, forgiving attitude towards his captives. Perhaps what is most surprising about Impressions of Africa is its essential innocence. Having approached it after many years of hearing about it obliquely, expecting a daunting and impenetrable work, I instead found a captivating and darkly whimsical, sui generis novel with a sense of childlike, infinite wonder. Polizzotti notes that among Roussel’s key influences were his frequent visits to the theater when he was young and a fascination with Jules Verne. Verne’s vision of limitless possibility, of other worlds beneath the sea or beyond the clouds, exists in spades in Impressions of Africa. But Roussel one-ups Verne by recognizing that unexplored frontiers include those of the imagination, and that in the discovery of new worlds, art may be among the bravest of adventures. [i] It’s revealing that Roussel attempted to produce Impressions of Africa on the stage. The play flopped, but I can’t help envying those fortunate enough to have witnessed the attempt. [ii] To date untranslated into English, but available in French. If I’d tried to find a book about Paris as far removed from Jacques Yonnet’s Rue des Maléfices as possible, I don’t think I could have succeeded more thoroughly than with Elaine Dundy’s The Dud Avocado, Where Yonnet’s peril-filled tales of the Occupation, gallows humor, and intimate, esoteric knowledge of city make for a gripping and penetrating work, all shadows and mystery, Dundy’s book, written a mere four years after Yonnet’s in 1958, is a soufflé baked of “gaiety, laughter, song-and-dance, shoes in the air.” The story of Sally Jay Gorce, an ex-pat 21-year-old American sowing her wild oats and aspiring to be an actress in the City of Light, The Dud Avocado evinces almost zero curiosity about Paris’ old places and traditions. Its characters – mostly other young ex-pats – seem to limit their interests to Paris’ bars and nightclubs and to one another, capable perhaps of naming the bartender at the Select, but unlikely to know the Conciergerie or the apartments of Napoleon III. A few pages into The Dud Avocado I began to suspect that the reliably good taste of New York Review Books had suffered a hiccup. But I’m glad I persisted; despite Dundy’s book being little more than a bagatelle on a topic (young Americans in Paris) for which I have little interest, Gorce (her name borrowed from a James Thurber story) is a surprisingly appealing young narrator, wise beyond her years, with a sharp wit and sharp tongue. It’s also one of those books in which one’s pleasure derives in part from seeing the writing, from start to finish, become better and better before one’s eyes. It’s also a very funny book. Another reason Dundy’s novel kept my interest even after taking the stage from as riveting a work as Rue des Maléfices is that it makes no pretense to being about Paris. It does not err where many subsequent tales of Americans in Paris do, by tediously milking cultural differences or rhapsodizing about the place as though no American had previously been there. For Sally Jay Gorce, whatever else Paris may be is secondary to its function as a liberating space to facilitate her fierce drive to live fully and escape her provincial, privileged, suffocating youth. And while most who come to Paris from other shores have neither the means nor the blitheness of Sally Jay Gorce, few possess her determination, social insight, and humor – which as Gorce notes about one of her impecunious ex-pat paramours, is a resource of immense benefit even to those engaged in the “epic battle…versus No Means Of Support.” Yes, she is but another young American trying out her wings in Europe’s capital, motivated by a sentiment that “The world is wide, wide, wide, and I am young, young, young, and we’re all going to live forever!” But she’s also unusually self-aware, recognizing that her time there, a gift from a rich uncle, is not only an irretrievably precious quantity of youth but also a flight from herself - the latest in a series of escapes that began at age 13, when, like Maggie in The Mill on the Floss running off to join the gypsies, Gorce let out for the American West hoping to reach Mexico and become a bullfighter. Here is the story of Bax’s life: he was born in Canada. He was raised in Canada. He went to Toronto University and has never been out of Canada before. He doesn’t know what he wants to do, but would like it to be something artistic. What happens when your curiosity just suddenly gives out? When the will and the energy stop and it all seems so once-over-again? What’s going to happen five years from now, when I wake up in the night…take a deep breath to start all over again, and find that I’ve no breath left? When I start running again and find I can’t even put one foot in front of the other? …I’ll be cooked. If I don’t stop it. 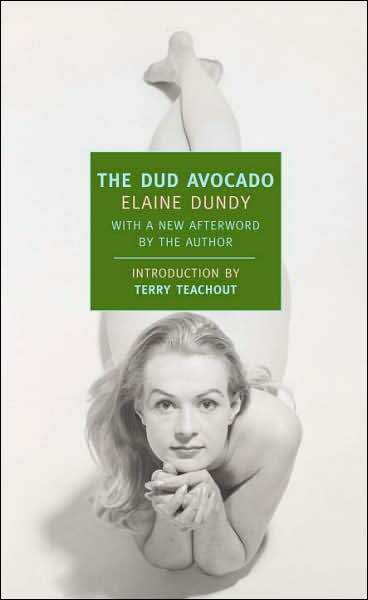 If The Dud Avocado offers few surprises and not a lot of depth, it is nonetheless a joy to read, with some unforgettable “bon mots” and, in Sally Jay Gorce, a winning main character who, in her unquenchable thirst to live life to its utmost, comes off as inspiring – even for an innocent American youth in Paris. Towards the novel’s end, Gorce recounts her bullfighter escapade and the understanding young woman at Traveler’s Aid who, instead of calling the police, had given Gorce some money and encouragement, telling the 13-year-old, “Good luck to you. You are running for my life.” Faulting The Dud Avocado for being what it is not, for its not being Rue des Maléfices, would be to miss the point. The ardor of Sally Jay Gorce’s indomitable spirit and wit, her insistence on staking her claim to youth, adventure, and uncontainable exuberance, can’t help but make a reader admire that fiercely burning flame. There’s enough energy in Gorce’s life to help power more than a few others.